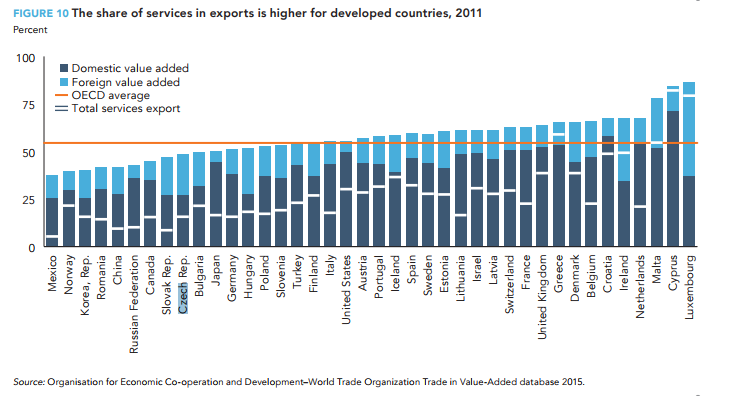 The Czech Republic, Hungary, and Poland, the largest players in intraregional trade in manufacturing inputs among the European economies, accounted for more than 11% of intra-Europe exports in intermediate goods in 2015, a share that more than quadrupled since 1995, the WTO Global Value Chain Development Report 2017 report says. Germany is by far the main trading partner for Eastern European economies in both regional and global value chains, with most of the trade involving intermediate rather than final goods. The share of intermediate goods in total Eastern European exports to Germany fluctuated around 60% between 1995 and 2015. In the same period, Germany accounted for 30% of Poland’s exports and 27% of its imports of manufacturing inputs. 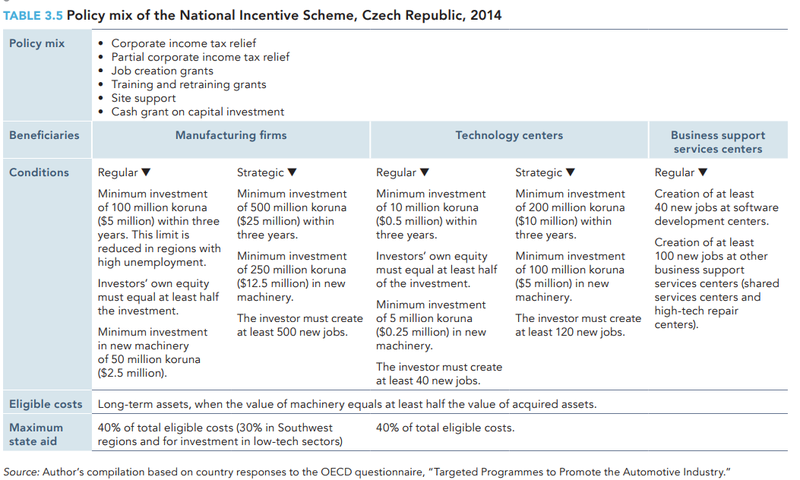 The shares for the Czech Republic stood at 36% and 32%. The two economies’ main trade with Germany is in medium-technology intermediates related to chemicals (excluding pharmaceuticals), machinery and equipment, and motor vehicles. Bilateral exports of manufacturing inputs between Poland and the Czech Republic increased rapidly between 2000 and 2015, at an average annual rate of 13.7%. Poland is a net exporter to the Czech Republic ($7.1 billion exports of manufacturing inputs versus $3.5 billion imports), and the Czech Republic’s share in Poland’s total exports of manufacturing inputs doubled during that period, reaching 8% in 2015. 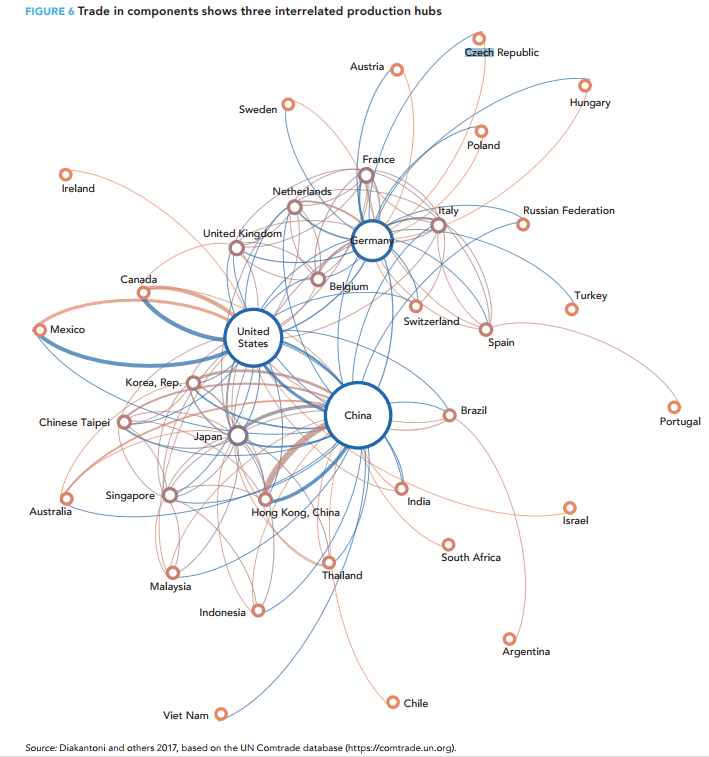 In 2015 approximately 80% of the intermediate goods exchanged between the two countries relied on medium technologies. Between 2000 and 2015 a significant shift occurred between the medium–low and the medium–high technology inputs exchanged by the two economies. 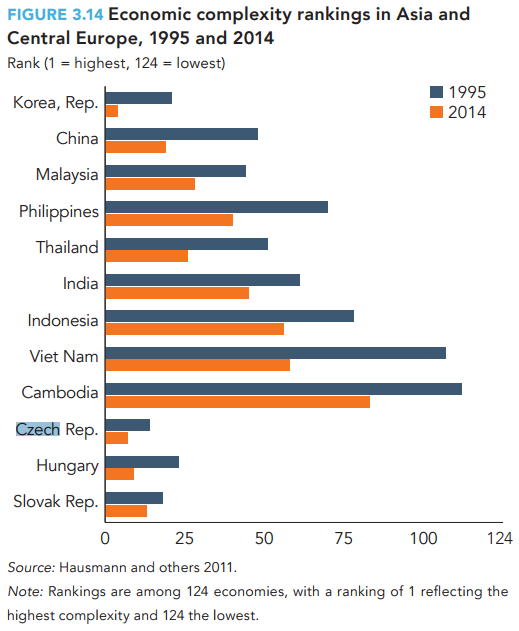 The share of medium–high goods Poland exported to the Czech Republic rose 13 percentage points while that of medium–low intermediate goods fell almost proportionally, reflecting a larger upgrade of Polish manufacturing industries in the European production chains than of its neighbor’s manufacturing industries. This is largely a result of the substantial increase in Poland’s exports to the Czech Republic in motor vehicles and transport equipment. Exports from the two sectors rose by around 27% a year on average between 2000 and 2015, when they made up nearly 50% ($3.4 billion) of Poland’s exports of manufacturing inputs to the Czech Republic.The inverse evolution is observed for medium technology exports from the Czech Republic to Poland. Between 2000 and 2015 Czech industries gradually began to specialize in medium– low technology intermediate goods for export to Poland, and bilateral exports of medium–high technology goods fell. This is the typical situation in GVCs: partner countries specialize in industrial technologies and tasks that complement each other. Poland took the lead for the production and export of medium– high technology inputs, while the Czech Republic specialized in medium–low technology. Read more details in the report.